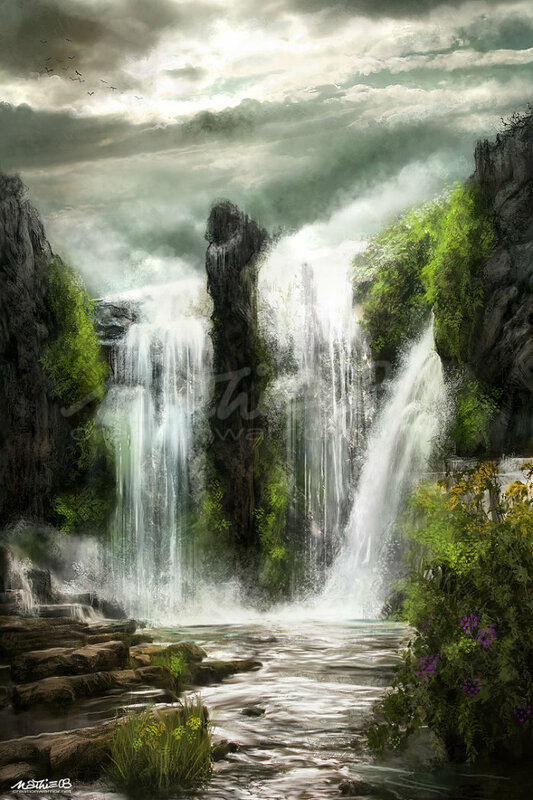 The roar of the cascading waterfall all but drowned out the foul screeching of two harpies flying straight at Kallin Rourke. The closest one, which moments before was perched on a tree on the other side of the narrow river, stopped within twenty-five feet of the elven ranger. It let loose a brutal, piercing scream that shook Kallin to the core and pulled him along the ground, closer to it. Seeing the elf on the ground, the other harpy flew to middle of the large pool of water and began singing a song. He tried to ignore the harpy’s alluring song, but couldn’t. The harpie’s melodic voice lured Kallin to the water’s edge. Just as he was about to fall in, he slipped and fell. His head struck the ground hard, the jarring impact causing him to regain his senses. Quickly, he took up his bow and fired at the harpy near the waterfall. His arrow struck true. With a piercing cry, the harpy plunged into the water below and disappeared from the ranger’s sight. Meanwhile, the other harpy flew down and tried to rake him with its talons. He dodged its attack and stepped back far enough to take a shot at it. His arrow buried itself in the thing’s chest. It fell to the ground dead. Or so the ranger thought. To Kallin’s horror, the harpy got back up on its talons. Its head drooped to one side while it hopped clumsily along the ground as if being controlled by some unseen puppeteer. Kallin took aim and fired. This time, the harpy stayed dead. In anticipation, Kallin turned his attention towards the waterfall. Sure enough, the harpy he had just killed earlier flew out of the water and came straight at him. A well-placed shot stopped harpy before it could reach him. Looking around to make sure the area was safe, Kallin carefully made his way to the other side of the river. He walked towards the north side of the waterfall. There, he found handholds and sure-footing along the cliff’s face. With some effort, Kallin was certain he can make the sixty-foot ascent to the top of the cliff. But just as he reached the top, two more harpies flew into view. Kallin, tired but with plenty of fight left in him, made quick work of the two creatures. After making sure that there were no more harpies in the area, Kallin looked at his surroundings. In front of him, a strangely-shaped white building stood before him. He saw strange markings carved all over the building’s walls. Something about the carvings reminding him of something, but he couldn’t place it. He spotted two door that afforded entrance to the building. A wide river—the source of the waterfall—stretched to the west as far as he could see. Across the river, he spotted other buildings, some bigger than the one nearby. All were also built at odd curving angles and were covered with similar markings. Stranger still, he spotted a boat nearby. It was elven in design. It sat at the river’s edge not far from the building. Knowing he had to solve the mystery of where he was, Kallin Rourke knocked another arrow and prepared to face whatever creature the Feywild was going to send his way.